New blog…new year! – It Works For Bobbi! Published on January 9, 2009 August 9, 2016 by Bobbi-Jo G.
Well, did you think you showed up at the wrong blog? Tee hee hee. Well, I obviously made some changes. After seeing such cute blog art on blogs like Simply B and Family of Four…Plus a few more, I felt the urge to create! I hopped on Photoshop and created an avatar me – minus the few extra pounds I’m carrying (it’s my way of being optimistic!). Does she resemble me? Hmmm… close enough! I also renamed my blog “It Works For me”, though my address is the same. I thought that changing my blog address might be a little too confusing, and I’d lose all of my loyal readers (Hi, Mom!). So, here we are – nothing like a fresh new look. Hey, you can even grab a button to the right of the page if you’re feeling daring! I plan to post some new tutorials, and *GASP* even some scrapbook pages I’ve been working on! I KNOW!! Wonder of wonders, I’ve gotten a couple of pages done. I’m still working on a couple of them, but I’ll be posting pics soon. I have not been feeling oh so inspired lately, so it’s been hard justifying spending any time on scrapbooking. As a result I’ve fallen behind. I REFUSE to let that happen! ARG! After getting caught up last year it’s NOT GOING TO HAPPEN, PEOPLE!! On that note – I can’t WAIT to get my Project 365 kit in the mail soon. Are you in on this? Did you manage to get a kit? I think this will be an awesome way to keep up with my scrapbooking this year. A photo a day for one year? I’m up for the challenge! Want to see todays? Yeah – dropping my husband off at the bustop a few blocks away early this morning. 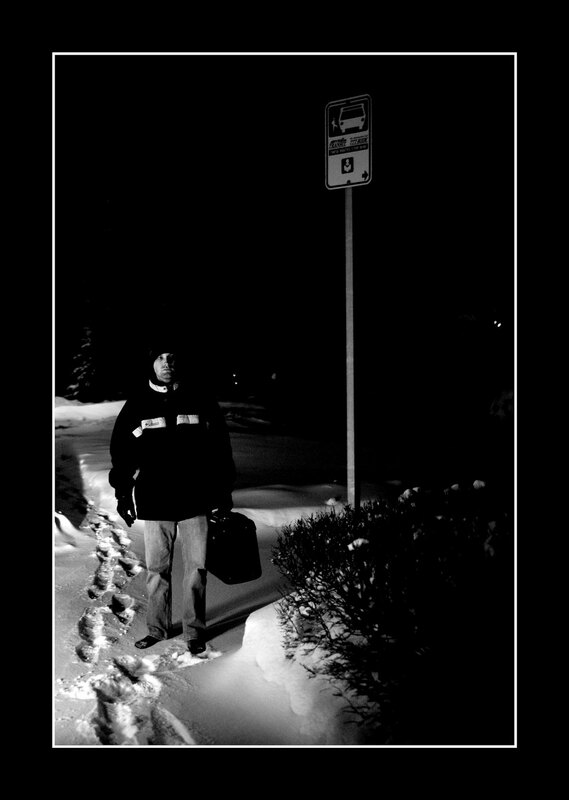 He was on his way to the university on a bus that goes directly there (which is great, but the only bus stop is a 7 minute drive from our house).Dressing the kids in their winter gear, packing the kids in the van, driving there, dropping him off, coming back home, peeling the winter clothes off the kids, feeding them breakfast, getting teeth brushed, hair done, lunches packed, myself ready, then getting all the winter gear back on the four kiddos, packing them back in the van, and driving them to the school. This is what we can look forward to every week if I want to have the vehicle during the day. TODAY am I EVER glad I had the van, though. B forgot her backpack at home, which meant packing up the two little ones AGAIN and driving back to the school with the backpack – imagine if I had to walk? BLESSINGS!! Anyway, I’m working on a fun photoshop tutorial for y’all, but not before I finish those pages! Gotta run! Ciao! I think your new layout looks GREAT! And I like your new ‘title’ too. Purple makes me happy! I’m so glad you got this up and everything working. It’s adorable. And I’m glad you like my work. But I have to be honest, you kick my can! But I’m alright with that.And I knew that was you! I can see it actually. Just when I think you couldn’t get any cooler…YOu have an avatar on your home page…I am totally going to steal that Idea!! YOUR AWESOME!! Love the new look…very fun!Ugh. And I thought it was bad I had to pack up two kids and drive the husband to work bc our other van broke down…we have no snow here and only had to pull fleeces over their little heads. Yikes on your day! Wow I started the photo a day on my own as my own little— thing. I will need to look into that though. VERY cute page! Very CUTE!! Nice new blog! Very cool and fresh looking! Thanks for not changing your address. : DCool pic of Lyndon too. That picture says a THOUSAND words!!! LOL! Love the look.I too get to pack the kids up to drive dh when we need a vehicle. I feel your pain. Except we get to drive for 90 minutes at the moment.And I’m trying really hard to not be jealous that you got a kit. I so wanted one. sigh.